Vitamins are a group of organic compounds that your hens require in small quantities. Despite the low requirement levels, vitamins are essential for normal body functions, growth, and reproduction. A deficiency of one or more vitamins can lead to a number of diseases or syndromes. 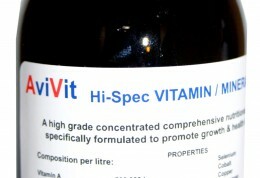 AviVit® Hi-Spec vitamin mineral tonic offers the best solution for all poultry keepers . Vitamin deficiencies can be due to a variety of reasons, including, inadvertent omission of a vitamin pre-mix from a bird’s diet, or vitamin destruction in feed due to storage time, humidity, or temperature. Feed supplied in plastic bags can suffer condensation problems if exposed to the sun or high temperatures. Most poultry feed is sold with a three month ‘use by’ date on the ingredients label. The date should be checked before purchase, as some vitamins start to degrade a few weeks after manufacture. Deficiencies don’t show immediately, but problems with the B vitamins appear first, whereas, deficiencies with fat soluble vitamins that are stored in the body, take longer to affect the bird.